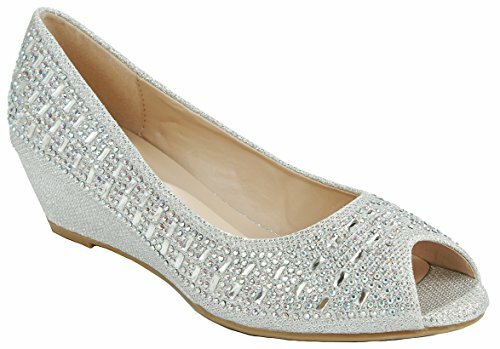 This is a chic sparkling dressy wedge pump that is great for every formal events. Featuring a glitter mesh upper encrusted with sparkling studs, a lightly padded insole, an approx 1.5" wedge/kitten comfortable heel. Easy slip-on style. Features: A glitter mesh upper encrusted with sparkling studs, a lightly padded insole, an approx 1.5" wedge/kitten heel. Easy slip-on style. Great for every formal events.